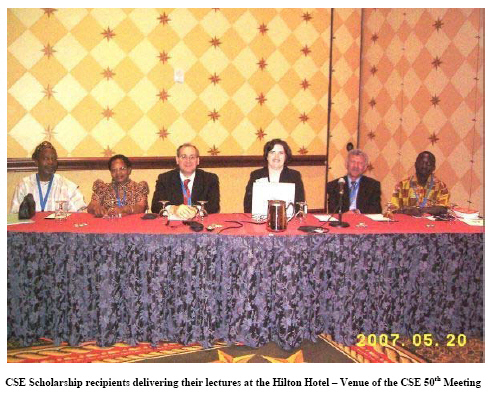 The prestigious Council of Science Editors (CSE) 50th Meeting was held in Austin, Texas, USA during the month of May 2007. The meeting featured Plenary sessions, short courses including the CSE short course for journal Editors May 18 – 19, 2007 and some other parallel sessions of interest organized by the CSE from May 20 – 22, 2007. This course for Journal Editors which covers topics as publication of the results of Research: Peer Review and determination of journal content; The organization, composition and function of an editorial Board; Journal office operations: Supervising Evaluation and Beginning Production and using metrics to improve your journal were very interesting. More interesting are the break out and discussion sessions. Another interesting aspect of the meeting is Microsoft power point presentations by the five 2007 CSE scholarship recipients including my humble self and also the presentation of scholarship certificates to the scholarship recipients at a luncheon organized by the council of science editors. The title of my presentations is View From the Developing World: AJTCAM’s Contribution In a Global Village. The power point presentation is provided below. More details can be found on the CSE website Workshops at: http://www.councilscienceeditors.org/events/annualmeeting07/presentations.cfm. 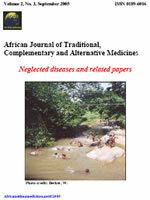 The other journal launched by African Ethnomedicines is African Journal of Infectious Diseases. This journal also took part in the CSE awareness progragram on poverty and development. Identify means of playing advocacy role for excellent working conditions. The opening ceremony commenced at 10 am and was attended by Major (rtd) Courage Quarshiga, Minister for Health, Ghana, Dr. J. Saweka WHO Representative, Ghana Office (WR, Ghana) and Dr. Jean-Baptiste Nikiema, Representative of Dr. Ossy Kasilo, WHO/AFRO Brazaville. “Lateral Thinking” or the openness of the mind of the researcher to other applications of the research results. The full presentation is available at the WANNPRES website www.wannpres.org. Importance of Analytical Chemistry in Natural Product Research; by Prof. Berhanu M. Abegaz, Department of Chemistry, University of Botswana and Network for Analytical and Bioassay Services (NABSA). From Raw Materials to Packaged Health Products: What do we need in Human and Material Resources? by Drissa Diallo, Department of Traditional Medicine, Mali, delivered by A. Maiga. Policy For Integrating Natural Products Into National Health Systems; by Mr. Peter Arhin, Director of Traditional and Alternate Medicine Directorate (TAMD), of the Ministry of Health, Ghana. After the discussions, participants broke into two groups for different activities. The activity for Group I was a Round Table Discussion of the keynote lecture and the symposium presentations, chaired by Professor M. Duwiejua of the Faculty of Pharmacy of KNUST, Kumasi, Ghana. The second session was led by Professor Clement O. Adewunmi of the Drug Research & Production Unit, Faculty of Pharmacy of the Obafemi Awolowo University, Nigeria. His presentation was on the topic: Common Problems Cited By Proposal Reviewers. Each participant received a hard copy of the salient points of his presentation. There were parallel oral presentations on day two and three. Participants were divided into two instead of the three groups originally planned for the parallel oral presentations. The presentations originally grouped under “Antimicrobials” were re-distributed to the remaining two on “Non-communicable Diseases” and “Analgesic/Anti-inflammatory Studies”. During this first parallel session some of the presentations on Antimicrobials were made in the group dealing with Non-communicable diseases. WANNPRES has now a website: www.wannpres.org. Members were encouraged to visit the site for information and activities of the network. Funding difficulties made it impossible to have simultaneous translations at the 2nd scientific meeting, as happened during the 1st Scientific Meeting in Accra. She apologized to colleagues from francophone countries. Cost for 2004 was five thousand dollars ($5000) and was borne by the Ministry in Ghana responsible for Regional Cooperation (ECOWAS). Need for preparation towards the future, especially with respect to mobilization of funds. The need for in-country activities and aggressive membership drive. Members should guard against adoption of standards set from other environments. Such standards are usually not only inappropriate for our needs but also belittle our achievements. Results must always be measured with resources used. WANNPRES should encourage members to set realistic standards for assessing our progress so as not to under- estimate or appreciate efforts of researchers in resource-limited environments. As the Minister of Health advised, we should guard against use of terminologies that alienate us from our traditional healers. Rather, we should harmonize the “language” we use in order to remove the apparent confusion in terminologies. An example is the use of such terms as complementary medicine and traditional medicine. Researchers should avoid use of terms such as “folklore medicine”, “concoction” which some may consider as derogatory but use appropriate terms such as “reverse pharmacology” that are more suitable since natural products scientists usually start from products used in humans before detailed pharmacological studies in animals are conducted. Researchers were reminded to research into herbal products of commercial interest, either on the basis of knowledge obtained from traditional use or through mass screening of all plant materials in a particular locality. Whichever approach is adopted, research must always be targeted at solving a relevant local problem like malaria, sickle cell, pesticide control, or food security. In the search for materials of interest, scientist must develop lateral thinking and have a wider vision. Whilst pursuing an identified objective, the researcher should explore other potential value/uses of products even if unrelated to the original objective. Researchers should feed back to communities about outcomes of materials collected from the area. Communities must have guarantees of deriving benefit from any commercially viable product developed from natural products obtained from the community. Sustainability of natural resources must always be considered in harvesting material from nature. This is particularly important for products derived from roots, stems or parts of plants that result in plant death. The meeting called on members to screen weeds that are a menace to a community. Such weeds may yield products of interest for further exploitation. Scientists with expertise in re-generating natural resources must be encouraged to join WANNPRES. Quality assurance is important at all stages during the research, especially of the raw materials. It is important that raw materials are authentic. Therefore, Finger-prints or markers of authenticity of all materials and final products should be identified. There is no one method of doing this. Each laboratory must develop its standards. Such methods must be simple and rapid; for example, a quick extraction with a non polar (e.g. hexane) and a polar (e.g. methanol) solvent followed by TLC to identify Rf values of components. Researchers should always keep herbarium samples of all plant materials, extracts and compound banks. Rf values of all compounds should be documented to prevent duplication and waste of resources. This information could also be useful for identifying compounds from other plant species. Researchers should strive to adopt quality procedures, including good agricultural and collection procedures (GACP), good laboratory procedures (GLP) and good manufacturing procedures (GMP) in research and production. This also applies to all basic research. WANNPRES should solicit support from Governments of the sub-region and other regional organizations to support researchers. External donors often have different interests and may not be interested in research for solution of local problems. Minimum infrastructural requirements for research should be provided e.g. assurance of constant power supply. Researchers should be more aggressive in seeking funding and looking for partnership from the private sector, including industry and civil society. Partnership should be formed right at the beginning of the research for it to be effective, sustainable and mutually beneficial. Researchers from more than one institution are encouraged to go in for Joint funding application(s) as such applications have better chances of success. WANNPRES should explore and press the need for the setting up of national herbaria that are linked regionally to follow the models in South Africa and UK. The natural product research/enterprise is multi-disciplinary. Expertise required is varied depending on the objective of each centre. However, it was noted that there was a particular need for taxonomists and other botanists who are scarce. A generic plan of activities of a natural product research team and specialist’s requirement is included in the appendix. It shows the need for a wide variety of expertise. WANNPRES and its members should pay priority attention to instrument purchase maintenance and service which includes appropriate training of laboratory technicians and users. Application for funding should including training of instrumentation technicians to ensure proper maintenance of expensive equipment. WANNPRES members are encouraged to network in country and within the sub-region for utilisation and maintenance of equipment. WANPRESS should actively recruit members with expertise in areas including anthropology and sociology and others (see Specialist’s Requirement for Natural Product Research in the appendix). WANNPRES should identify Centres for training of its members. WANNPRES should establish a committee to look into core activities and Centres and identify a critical mass of scientists for effective work. The meeting congratulated Ghana for setting up a herbal medicine school at the university level. The meeting called on other governments in the sub-region to encourage their institutions of higher education to set up similar programmes. It recognized Ghana’s efforts at trying to set up a Council to regulate the practice of herbal medicine. WANNPRES in each country should encourage collaboration between all ministries related to natural products. WANNPRES should endeavour to engage in research projects that can easily be used to guide policy action on health maintenance. The next item for discussion was the theme for the third Scientific Meeting. By consensus, the meeting selected “Challenges of Research into African Plants as Natural Food and Medicines” as the theme for the 3rd Scientific Meeting. The following sub-themes were also agreed upon, all relating to natural products: Capacity building in research; Sustainable use; Safety; i. Food and drug Interactions ii. Toxicity; Returning benefits to local communities; Standardization.